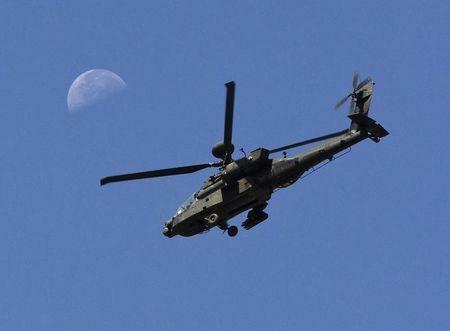 CAIRO (Reuters) - Egypt received 10 Apache helicopters from the United States in the past week, security sources said on Saturday, a sign of easing tensions between the long-time allies confronting Islamist extremism across the region. The United States originally announced in April that it had decided to lift its hold on the delivery of the attack helicopters, imposed last year after the military toppled elected president Mohamed Mursi and cracked down hard on his Muslim Brotherhood supporters. The Pentagon said in September that the United States would deliver the helicopters, built by Boeing Co., to support Cairo's counter-terrorism efforts. The most powerful militant group there, Ansar Bayt al-Maqdis, swore allegiance last month to Islamic State, the al-Qaeda offshoot that swept across northern Iraq and Syria earlier this year and now faces U.S.-led air strikes. Egypt has created a one-kilometer buffer zone along the border with Gaza by clearing houses and trees and destroying subterranean tunnels it says militants use to smuggle arms from Islamist-controlled Gaza. President Abdel Fattah al-Sisi, who as army chief ousted Mursi, has also expressed concern over militants who are thriving in the chaos of post-Gaddafi Libya and are opposed to the Cairo government. Critics say Egypt's crackdown on Islamists is trampling on human rights and expanding to include peaceful protesters as well as secular and liberal activists. In another sign of improving relations between the two countries, Stephen Beecroft, the new U.S. ambassador to Egypt, arrived in Cairo on Thursday. The previous ambassador left the post more than a year ago following Mursi's ouster.